Thank you is not a big enough word to show our gratitude to all those who have supported and encouraged us in our business venture over the last five years! Jon and I have been overwhelmed with the support shown on the evening and the messages received since our celebration event on 25th January at Malmaison in Leeds. We were joined by Channel 4’s Millionaire Party Planner Liz Taylor who has organised some of the most lavish parties, weddings and birthday bashes for the rich and famous and gave an interesting and amusing talk. 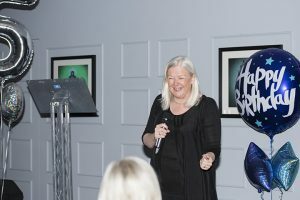 Lucy Brazier, CEO of Executive Secretary Magazine was a guest speaker at our pre-launch over five years ago and while it certainly wasn’t her first return to Leeds, it was fantastic to hear her speak again. We were delighted to raise £364 with a charity raffle on the evening for Action for Pulmonary Fibrosis with PA Hub member Ann Dunford (Former Yorkshire PA of the Year) who has the condition. Reaching a milestone like this does remind you of all the hard work that goes into making a business a success. We have had some tough times and anyone in business will know it is not an easy road to follow. However, that old mantra of, ‘If at first you don’t succeed – try and try again,’ is so true. Sometimes things haven’t worked and with experience you learn to fix it, change it or start again! Our business has definitely pivoted a number of times in 5 years and I am sure it will again. The trick is to know that this is ok! Admitting that is a gift in itself. 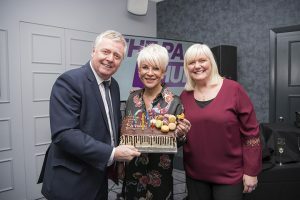 The PA Hub has made excellent progress in putting PAs on the map in Yorkshire and Merseyside over the last 5 years and has seen a huge growth in membership. The PA Hub has become the leading network for Yorkshire & Merseyside PAs while still keeping the family informal feel of the group. The network has grown from a small number to a group of over 800 assistants and represents some of the biggest businesses in the North. Whereas previously PA events would be held around London, The PA Hub has been representing the Yorkshire region for 5 years & the Merseyside region for 2 years with show-stopping speakers for a specialist, and often overlooked industry, providing events and conferences solely in the North. Events have showcased Ann Hiatt (Chief of Staff & EA to Eric Schmidt, Chairman of Google), Frieda Kelly (The Beatles Secretary), Donna Coulling (PA to Helena Bonham Carter & Rachel Weisz), Howard Webb (World Cup Referee), Jamie Jones Buchanan (Leeds Rhinos), May Pang (Former EA to John Lennon), and many more. Looking back at that 1st membership event where only 9 people turned up (I nearly threw the towel in then) and looking at the network we have today, we do feel proud and appreciate the advice from so many people along the journey. The support has been incredible and we are so grateful. We now run 20 membership events, 4 Showcases, 2 Conferences, training courses and the Yorkshire PA of the Year Awards as well as co-ordinating international events with Executive Secretary LIVE. Who knows what the next 5 years will bring! We look forward to fulfilling our new 5 year plan and our next milestone of 10 years! While running a business can be challenging at times it is also the most rewarding pathway we have walked. Here’s to the next 5 years and to the amazing PAs of Yorkshire and Merseyside.